My husband came home for lunch today, and I was telling him all about what Saren and I are doing with The Power of Moms. Our book is coming together (oh, the editing is quite a process, but it IS coming! 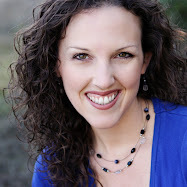 ), our videographer did an amazing job capturing the essence of our April Power of Moms Retreat, which we're now putting into an online multi-media program for the site, our second "Entitlement Trap" webinar is on Tuesday with the Eyres, we've got great podcasts scheduled, our board members are doing amazing things (providing quality content, helping us develop a Power of Moms store, reaching out to bloggers, and running the everyday needs of the site), and we have a Couples' Retreat coming up in September--plus lots of other exciting developments and activities I can't list. Then we started talking about the "big" stuff--our Australian tour we're planning for March, the PR efforts Saren and I are working on, and our goals to reach the millions of moms who need to be a part of this organization. That's when I start to shrink. It all starts to feel so big, and although I want this organization to grow into what it needs to be, I have this innate tendency to want to keep my life small and controlled. I'm getting outside of that mentality, though, because when someone believes in you, you feel like you can do anything. My husband is definitely my biggest cheerleader. Earlier this week, I said, "I have a little meeting tonight to discuss PR with one of our new board members." He challenged me. "A little meeting? There's nothing little about what you're doing here. Are you going to have a powerful meeting where you're going to design an effective program to take The Power of Moms to the world, or are you not?" I wanted to get angry with him, but he was absolutely right. And so I did (okay, I did my best--I'm still not great at this). With the help of our wonderful board, and all the moms in our community, this organization is going to grow. Today at lunch, he said, "April, you're shaping the world. Why is it so hard for you to believe in yourself? You and Saren are teaching true principles about the power of motherhood--and you're working with a power that is greater than you. What holds you back?" I sat on the stairs, put my head in my hands, and said, "I don't feel like a world leader. I feel like the mom who hasn't showered yet today." "Well, then, you are the mom who hasn't showered yet today. But most of the time, you do shower, and sometimes you're the mom who's all dressed and ready to go, speaking to women at Retreats, helping them see how powerful they are. Right? Don't underestimate who you are." How can I not be strong after hearing all that? And then there's my children. They are my next biggest cheerleaders. Alia and Grace have been working on their blogs, and they wanted to be sure to have our Power of Moms button on their sidebars. Click here for Alia's Ideas, and click here for Grace's Place. I feel so blessed to have their support. And, of course, there's my own mom and dad, my siblings, and Eric's family--plus my website partner Saren and her whole family, who have been extremely supportive and involved from the beginning. The reason I'm posting all this is because (1) I want to explain that none of this comes easy to me, but I do it because the people I love believe that I can do this. And (2) I want you to know that I believe in YOU. I have absolute confidence that those who want to create strong families, live up to their full potential, and make a difference in the world have the power within them to do it. And even if you don't feel like you have anyone who encourages you to accomplish what you were made to do, all of us have God. And He believes in every one of His creations. Dreaming big and going after those dreams is a scary thing. But scary is good. 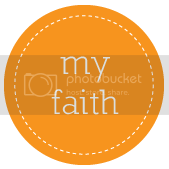 Just join with me as we step outside our comfort zones--and believe. I feel like a new person after spending the last day and a half really thinking. My brother and sister-in-law were kind enough to take Spencer to their home for a couple of days, and Eric took our older three children to see his side of the family for the weekend, which left me in my house by myself for the first time in 12 years. Our house was so QUIET, but it was a wonderful chance to take a little break. Although I did miss everyone terribly, I've learned some valuable lessons (which I'll briefly share here since I poured my heart out in the last post, and I don't want to leave you hanging). Spencer wants to admire each dandelion he picks from the backyard: "See, Mommy! See how this one is all closed up. And this one is tall. And these three go together." He points out that the brown Hot Wheels car is his favorite, and it looks the coolest when it rolls next to the white one. He doesn't like how the reduced-fat string cheese tastes. He gets scared if he plays in his room alone, and he can't figure out how to get his sandals on the right feet. This boy has got a lot to say! Yesterday morning, right after I picked him up, he sat in my lap and held his cheek against mine. We shared a closeness that I've been missing for several weeks, with all our travel and summer activities. "Mom, I want to be with you for a big long time," he whispered. I kissed his forehead, his cheeks, his nose, and the top of his head. Then I told him that I, too, want to be with him for a "big long time." The talking, kissing and loving is part of what makes motherhood so busy. I haven't valued that enough in the past, so I'm going to start (again). (2) This time with young children is a gift. One of my questions from the last post was how much a young mom should do. Part of that answer is that I should only do what can be done in the hours I've allotted for "extra" stuff. (I know . . . isn't that obvious, too?) I always try to cram in "one more thing," and that's not the way to live. Even though it feels like I move too slowly with the work I feel compelled to do, that's good enough. These years are going too fast, and I will just have to trust that the Lord will help me work quickly and effectively in the time I have. and watching my children find joy in life's simple pleasures are just three of the things I love about motherhood (among thousands). (3) Breathing is good. I'm not very good at breathing, in general. I hold my breath way too much. However, this weekend I've made it a point to slow down and breathe between activities. I sat on the couch and read some articles I'd been wanting to get to. I ate my lunch on the porch with Spencer and enjoyed the shade of our tree. Moving at a fast pace, even when my intentions are good, isn't sustainable (or healthy), so I'm going to make sure I breathe deeply and often. To those of you who are waiting upon the Lord for guidance in your lives--who need help with a major decision or question--I give you this challenge: Prayerfully and carefully use your own intelligence and your own resources to choose a path that seems right to you. Then become anxiously engaged in walking that path. When the time for course correction comes, He will be there to help you and to guide you. Isn't that beautiful? I'm already on a path that seems right to me, and though I don't feel that I am exactly where I need to be yet, I'm going to pay close attention to opportunities that come to me, and I'm going to listen carefully for further instructions. If I'm consistently asking how I can be helpful each day, I have no doubt that I will achieve that goal. Time to read stories with Spencer! Thanks for listening, and if you have any other advice or ideas, please share. I appreciate it. A fun interview with Sonia at Happy-Go-Baby. 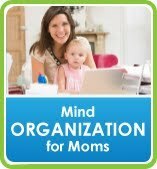 Sonia is part of our Mind Organization for Moms community, and she's been working on a darling website with "creative, unique, practical" baby items. 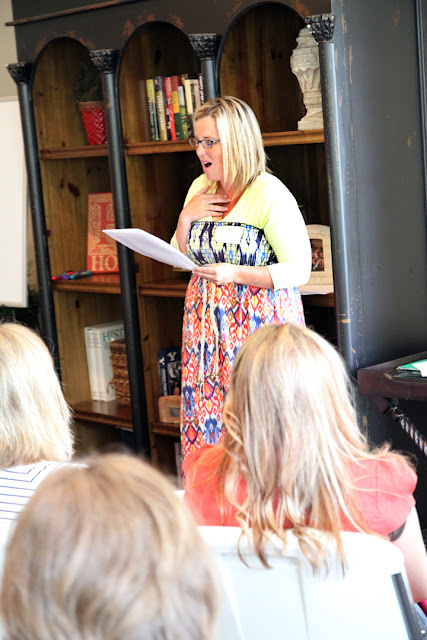 I love seeing how this program helps moms move their projects forward. Yay, Sonia! This recent article at Deseret News: How to Let Go of a Lot of Things a Little Bit (where I tell all about the snags in my carpet, the hole in my ceiling, and the time we taped our car together). A podcast about balance--recorded on a day I never took a shower, cried to my husband for 15 minutes, and took TWO naps. Work with our board of moms (who I couldn't live without) as we keep the site running, expand our offerings, network with other bloggers . . .. These ladies are some of my dearest friends. I need to do a whole post explaining how they're changing the world. 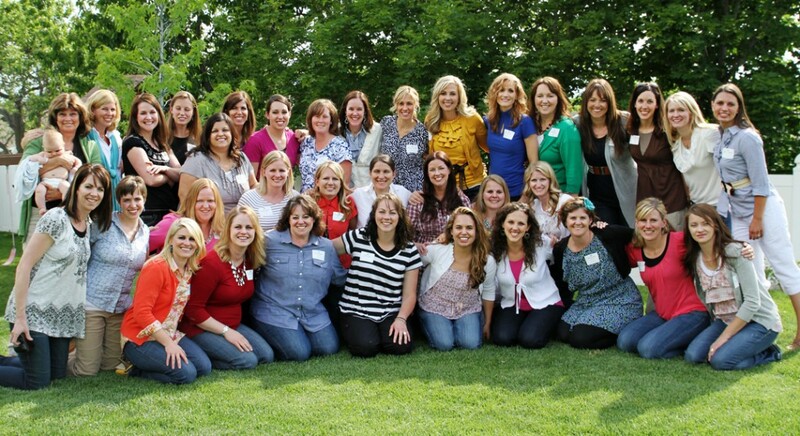 A Power of Moms Retreat, which needs a whole post of its own. 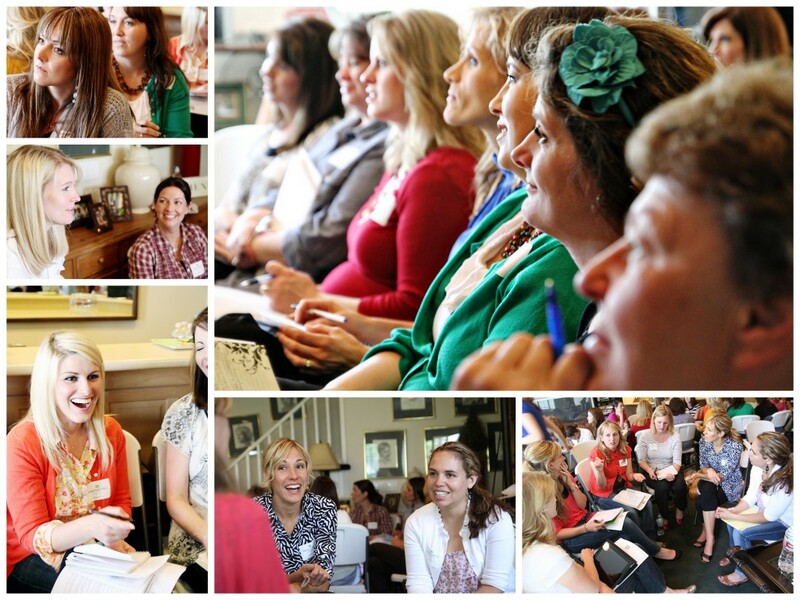 My new friend Rebecca Walters took some amazing photos there that captured the beauty of the small-group discussion format, and I feel like I made dozens of new friends--women I truly admire and want to be like. Here's a photo of Saren and me. 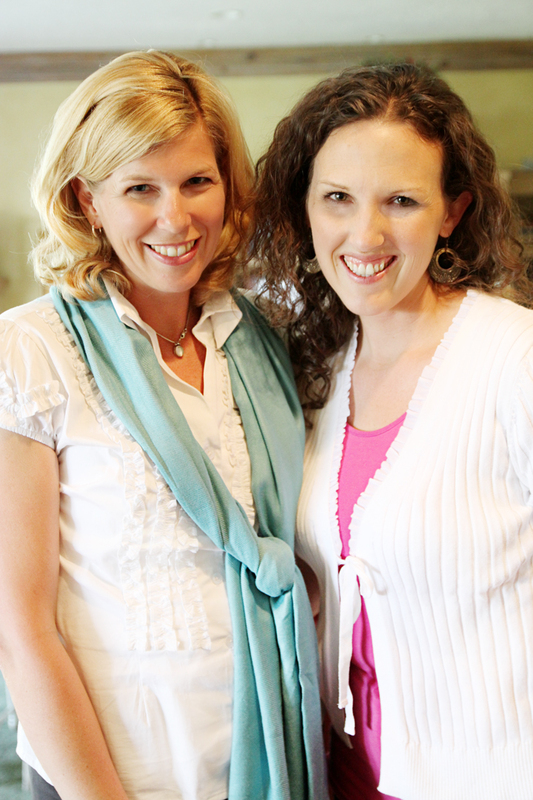 I am very, very grateful to have her as my friend and business partner. We also got to hear from Courtney Kendrick, who truly inspired us with some readings about family and motherhood. LOVE the Retreats! (Have you been to one yet?) We're currently planning a Couples Retreat in September and full "mom" Retreats in October, November, and January--plus an Australia tour in March 2012 (more on that below in section #3--I've never even had a passport, and I'm feeling REALLY excited and REALLY nervous about flying around the world). A much-needed vacation to Aspen Grove Family Camp in Utah, where we met up with seven other families who went to school with us in Boston. We also stayed an extra week and visited with my husband's family, Saren's family, my sister Page's family, and some other great friends we haven't seen in years. The Library Summer Reading Program. We have a darling librarian here named Nancy who makes our trips to the library magical. My children love her and read their stacks of books with gusto. Housework. Our house is a happening place during the summer. It's hot outside, so we stay indoors a lot, which means there is plenty to do to keep our home feeling "clean enough to be healthy, messy enough to be happy." My children have been organizing, mopping, vacuuming, scrubbing, "picking up," helping with the cooking, playing with Spencer, and just spending lots of time with me (which I acknowledge won't be the case in a few years). We're becoming better friends, and I love it (but I also need a little break once in awhile because the constant action is a little exhausting). Development. My husband went to Office Depot the other day and found some incredible CD-Roms on the clearance table. Typing software and building-design software were just a dollar each, and my children (8, 9, and 11) LOVE them! We found out that our library has a "Mango Languages" program for free, as well, and it teaches our children to speak Spanish. 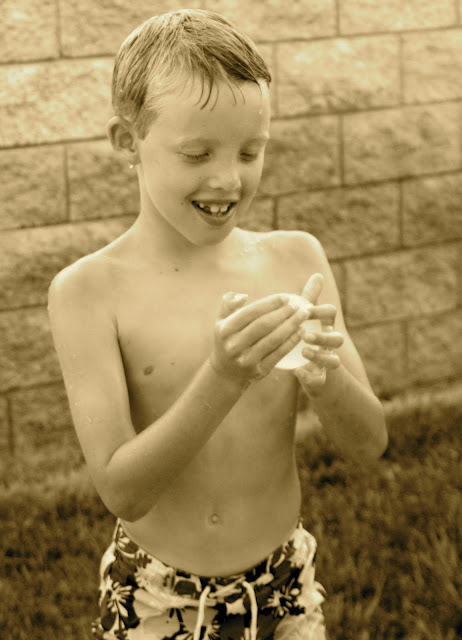 I've also been working with my children on their "Summer Goals" (also another post I want to write), which has been such a blessing to our family (except that I haven't quite coordinated the goal-tracking sheets yet, so they're more like "Summer Ideas" at this point. Swimming, jumping on the trampoline, visiting friends, going to the park . . . being kids. I had a good talk with my friend Elizabeth yesterday, who has been a foster mother for years and has lived through circumstances I can't even fathom. Some of the children she works with have been victims of all kinds of abuse. She said, "I feel so good when I can see my children playing and 'being kids' because not every child has that chance." I know it's a blessing for my children to get to enjoy their childhood. Alia is officially 11 1/2 today, and she is like "Mommy #2." 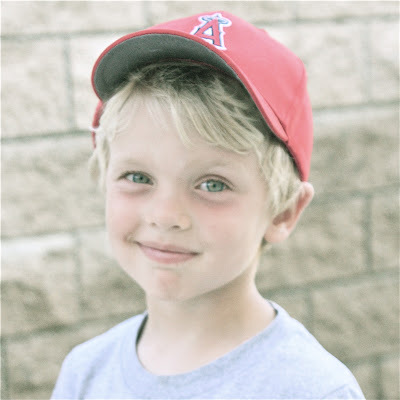 Spencer told his Sunday School Teacher, "Alia takes care of all of us." Spencer took this photo of Grace in our backyard, and I loved seeing her from his perspective. She is a sweetheart. 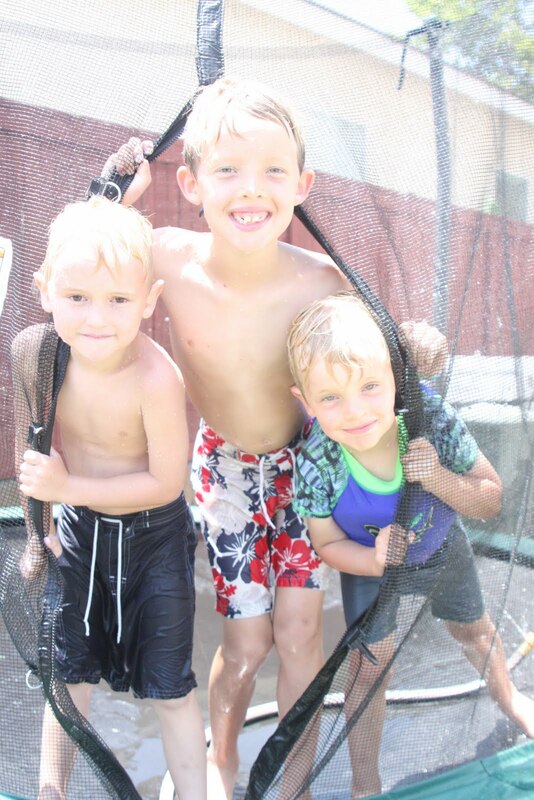 My nephew (left) came over for a couple of days, and he and my boys jumped on our trampoline for about 12 hours--sometimes with the hose, sometimes with water balloons, and sometimes just with the giggles. (Spencer wanted to wear his floatee-suit out there.) I love those boys. (1) How much should a young (I'm 33--that's still young, right?) mother of young children do? I've always considered myself to be good at prioritizing and "not scheduling too much," but goodness, now that my children are growing up and my website is reaching so many moms worldwide, the options to "do" are overwhelming. For example, I'm dying to meet Felicity and Naomi, two friends in Australia who are helping to plan our Retreat there in March. Saren and her mom and sister might be going, and I don't necessarily "need" to go, but my husband is encouraging me to do so, and I know I would love the opportunity. That's one of the bigger decisions I'm weighing, but there are also lots of little ones. I want to take photography classes with Alia and Grace, work on Cub Scouts with my son, and read all our "baby" books to Spencer before he doesn't like them anymore. I have video footage of one of my Mind Organization presentations ready to be uploaded to the site, I'd like to write as a special contributor to CNN, and I'd like to create the five new programs Saren and I have been brainstorming. I wrote about doing the things that can only be done now back in this post, but lately the lines seem to be blurring as to what needs to be done now and what can wait. (2) How can I be most helpful? In my talk with my friend Elizabeth that I mentioned earlier, she told me about her hard, hard life growing up. She wasn't complaining--just sharing her history and explaining why she now takes care of so many children (some adopted, some foster children)--even though she's 65 years old. Her grandmother was a maid for a family in Florida, and she had to go to work each week, leaving four children under the age of 10 (Elizabeth included) home alone most of the time, and only returning on Mondays, Wednesdays, and Saturdays. She'd give the children a dollar for bread and syrup, and they would take care of themselves in a house that didn't have a stove, a bathroom, a heater . . . anything. That's just the start of her story. I hear experiences like that--along with stories about children and families worldwide who are struggling, and they pierce my heart. I can't focus on things like home decor, shades of nail polish, abs of steel, or gourmet cupcakes because there is something deep inside me screaming, "DO something." I have an education, a home, a husband I love, four healthy children, food to eat, and a platform where I can communicate with thousands of women . . . what am I doing with this life and the opportunities I've been given? I'm taking today to really think. I'm thinking about my current projects and goals, thinking about the family and future I want to create, and doing my very, very best to hear God. That's the only answer that really brings me confidence: Listen to God. Our church has temples around the world, where we can go to learn about God's purposes for us. I've heard the temple referred to as the Lord's University, and today I'm going there to talk to Him. It's a beautiful place--quiet and peaceful. I know many religions have beautiful sanctuaries where people can commune with God, and I feel grateful to have our temple in Redlands as a place of Retreat. When I go there, I feel like I'm "going home." I feel how much God loves us, I receive that sense of calm I desperately need, and I always learn something new about how God works with His children. Now that I've essentially poured out my heart, I feel timid about pressing the "publish post" button. I keep a separate, private journal because the things that I'm learning are very personal to me. However, I occasionally feel that I should share some of these things on my blog--in case it might be helpful to someone else out there. Have a wonderful day. I'm off to my Retreat.